The others said, “We will go with you.” They went out in their boat. But they didn’t catch a thing that night. 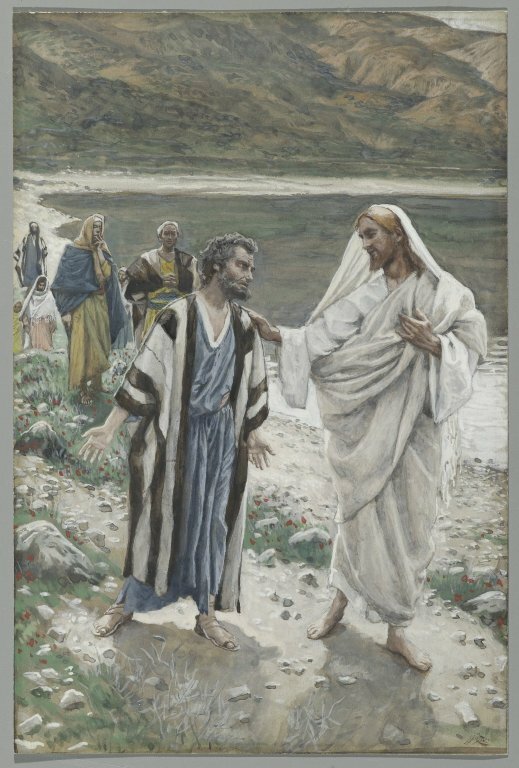 7 Jesus’ favourite disciple told Peter, “It’s the Lord!” When Simon heard that it was the Lord, he put on the clothes that he had taken off while he was working. Then he jumped into the water. 8 The boat was only about a hundred yards from shore. 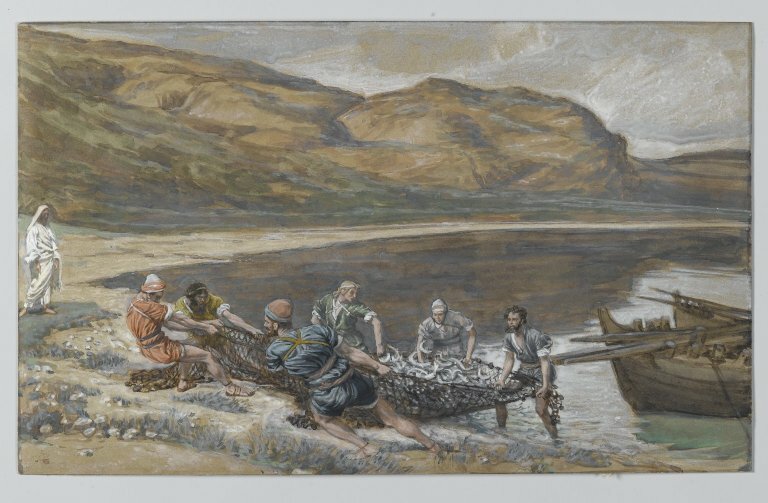 So the other disciples stayed in the boat and dragged in the net full of fish. 12 Jesus said, “Come and eat!” But none of the disciples dared ask who he was. They knew he was the Lord. 13 Jesus took the bread in his hands and gave some of it to his disciples. He did the same with the fish. 14 This was the third time that Jesus appeared to his disciples after he was raised from death. This is one of the most beautiful moments in the whole of Jesus’ life and work. He appears to all the disciples, reassures them again that he is alive – but then he has a special word for Peter. Wonderful impetuous Peter. Always the one to do or say exactly what he was thinking, never one to hold back – yet now living with the fact that when it really mattered, he had let Jesus down. When challenged he had denied ever having known him. Not sure what to do any more, he had gone back to his fishing, to the place he felt secure; where he knew what was what – but where Jesus had called him from. But Jesus comes looking for him. Peter is given the opportunity to put it all right. Jesus could have just told him that it was ok, he was forgiven, but he goes further than that, he gives Peter the chance to say something, to respond to the questions – 3 times as he denied him 3 times – to say it, to confirm his belief and his love. Through Jesus’ love, he becomes a restored man, he is returned to who he was – but more than that equipped for what he is going to be. Peter is given the opportunity to put things right. Jesus gives us that opportunity too. If there is something gnawing away at you. Something you know you’ve got spectacularly wrong, Jesus gives you another chance. He comes looking for you, to talk to you, where you are, to free you. We too are invited. Even if we had run away, gone back to what we knew, he comes to us, gently puts his arm around us, and restores us and equips us. Beautiful song! Thanks so much for sharing it. We are so incredibly blessed that He restores us when we seek Him. Blessings.